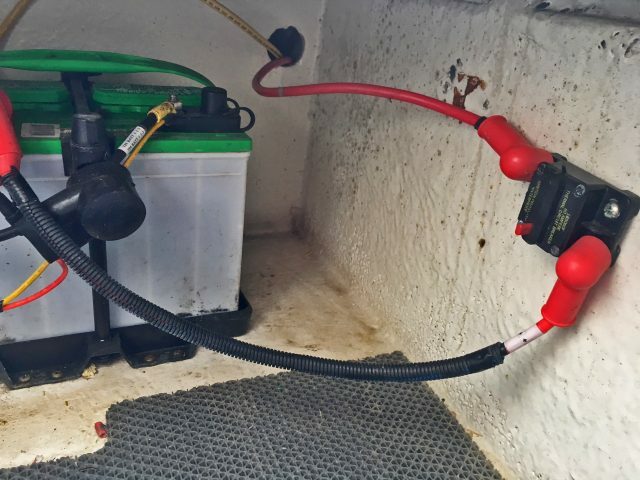 Editor’s Note: Erik Landesfeind explains how to wire a trolling motor in this detailed summary of the process he used to fix a electrical problem on his boat. If you’re an inshore angler like me you probably rely heavily on your bow mounted trolling motor when fishing bass. And if you rely on it long enough, sooner or later it’s going to stop working. 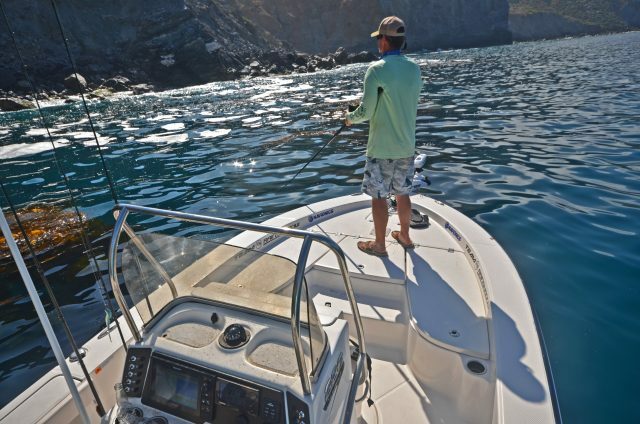 The good news is that more often than not the fault isn’t with the expensive trolling motor itself, but with the inexpensive wiring that brings it power. I ran into just that situation last month when my motor stopped working. After spending hours beating my head against the wall trying to figure things out, I broke down and called Nick at the Trolling Motor Doctor in Long Beach. After checking out the motor itself and giving it a clean bill of health, Nick explained my problem lay somewhere between the batteries and the motor itself. 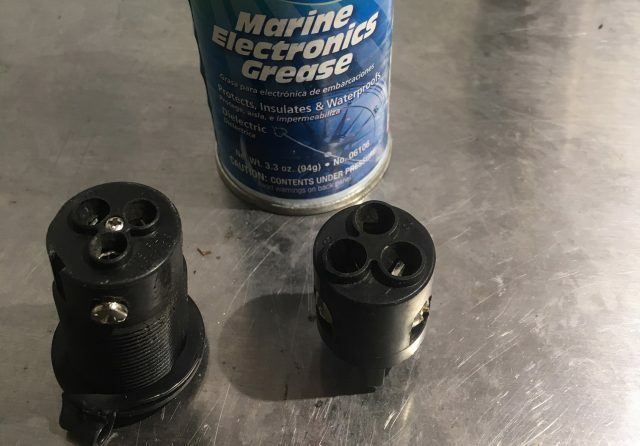 After looking everything over I noticed quite a bit of corrosion on the plug from electricity coming in contact with the marine environment so I decided to start from scratch and replace everything. I started out by making some new battery cables. 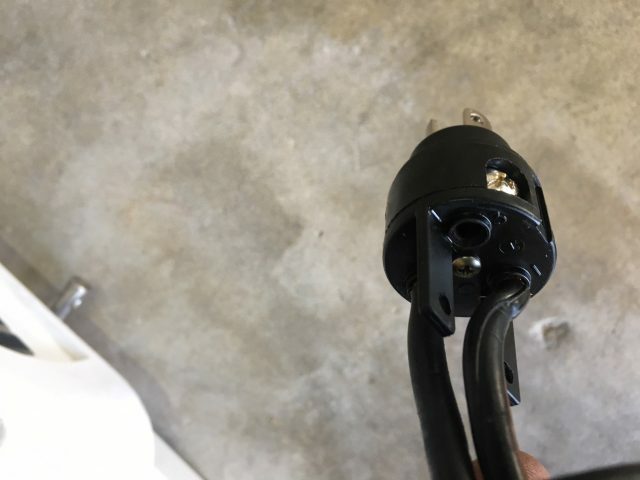 Since I replaced the normal battery cables in the boat with a heavier gauge I had to get an adapter that would accept the bigger wires into the plug. I went with the bigger gauge wires to minimize voltage loss over the 15-foot wire run between the batteries and the trolling motor. 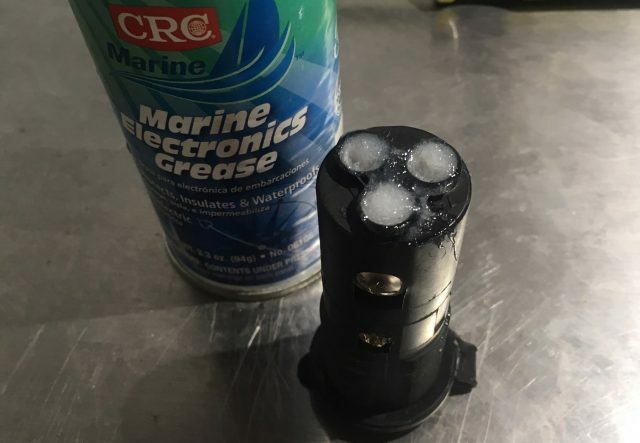 To prevent water intrusion into the plug and adapter assembly, I packed everything full of Marine Electronics Grease. This grease is non-conductive so feel free to use it liberally. I had planned to shoot some photos of how I pulled the new wires through the boat but it ended up being an absolute nightmare and I my hands were bleeding too profusely to operate the camera. I’m sort of kidding but it was tough. If you’re ever replacing wires, I recommend testing to see if they pull more easily from one end or the other. Once you find the path of least resistance, tape the old wires and new wires together using duct tape, use a lot but try not to let it build up too thick. Then spray the tape down with WD-40 or whatever you have handy and get a friend to push the wires while you pull gently from the other end. 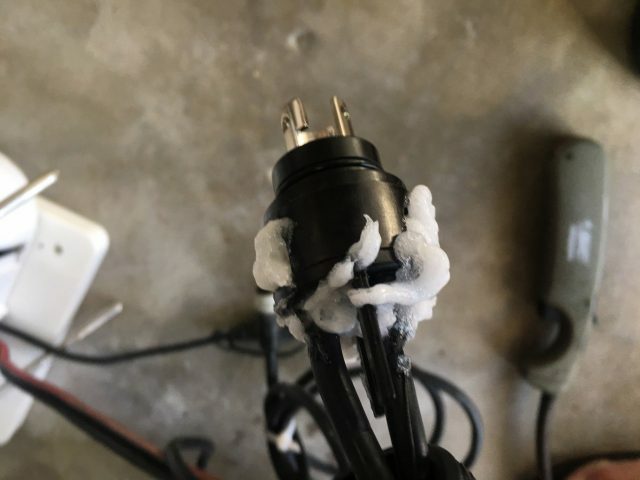 Once the wires were through, I connected them to the plug. 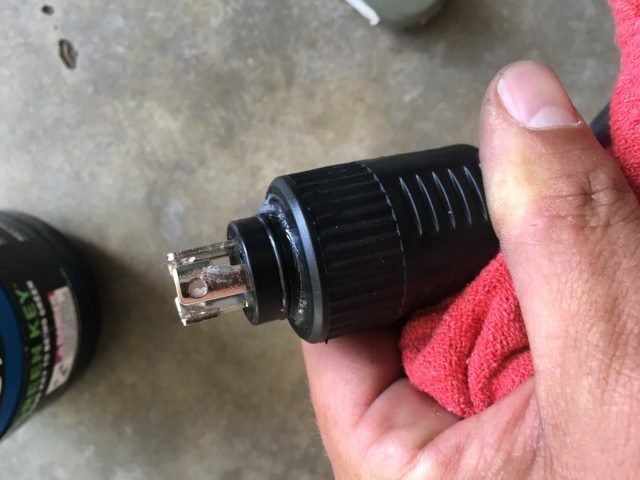 To save yourself from doing it twice (I speak from experience) make sure that the locking nut that holds the plug is placed over the wires before you push them through the hole in your deck. On the other end, the negative wire goes to the battery and the power wire attaches to a 60-amp breaker. While this breaker is there to trip if there’s a problem with your power or motor, it also works as an on/off switch for your power. 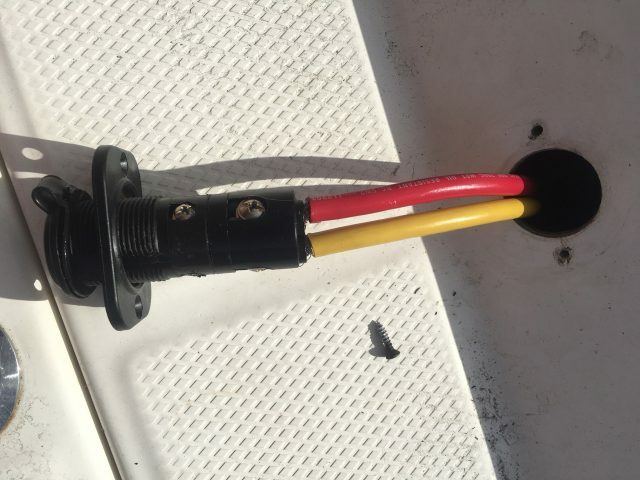 One of the reasons I had corrosion issues was because my plug in the bow was getting power even when I wasn’t using my trolling motor. Too much spray over a couple of years caused it to fail. Going forward, I will keep the breaker shut off unless I am actively using the trolling motor. That should extend the life of my wires significantly and can prevent a fire hazard. Regarding power, you’re going to need to make sure that your motor gets the required voltage. Trolling motors run on either 12, 24 or 36 volts and to get 24 or 36 you’re going to need to run your batteries in series. This diagram shows how a 36 volt trolling motor would be set up. For a 24 volt like mine, you’d just remove one of the batteries and for a 12 volt system you’d remove two. It’s really pretty simple. You’re going to need a way to keep those batteries charged, so you’ll want to install a charger you can plug in when the boat is not in use. 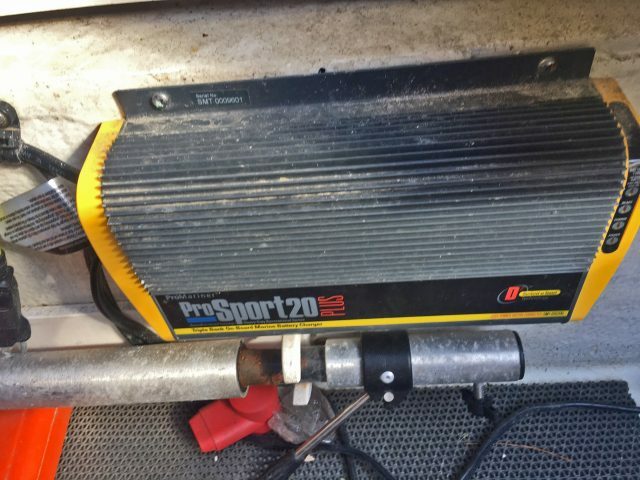 I have a Pro Sport 20 which is a three bank charger that allows me to charge both trolling motor batteries and my house battery. To set this up you just attach the positive and negative wires to each of the batteries you want to charge. Even though the trolling motor batteries are wired together they each need their own charger lead. The final step is rigging the male end of the plug to your trolling motor. These plugs come with room for three wires, and are numbered, so you want to make sure that if you used holes 1 and 2 on the female end, you use holes 1 and 2 on the male end as well. The plug is in a very wet part of my boat, so I loaded up on the electrical grease and covered everything metal before sliding the cover over it. If you are getting corrosion due to electricity and water, these plugs will be the first obvious signs. If any of them start to look green, you’ve got a problem. Power can be checked at the plug using a volt meter. If you’re testing 24 or 36 volt make sure and have your meter set to read “200” instead of “20”. If you’re running 12 volt, set it to “20”. If you’re getting a negative number, just swap the red and black probes. 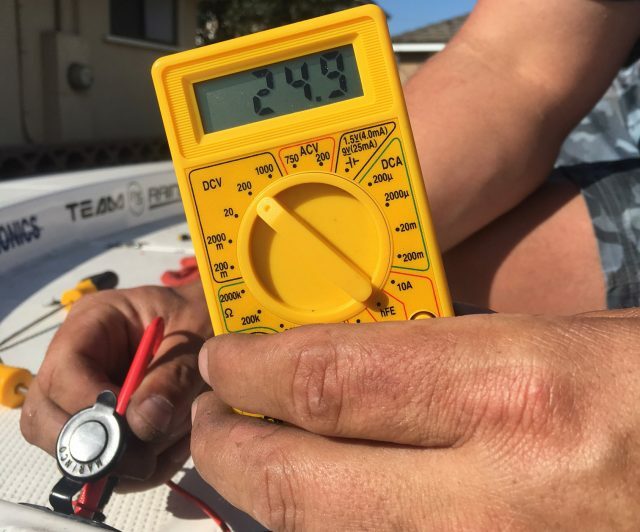 If everything is working properly and your batteries are charged, you should get a reading slightly above the voltage rating. Any lower and there is a problem. 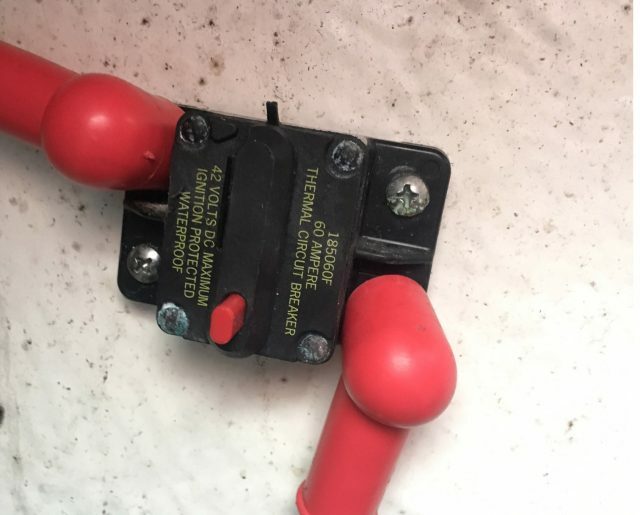 One of the most common problems is a loose connection on a battery terminal, so always check that first.